A new large lifeboat launching system arrived at Lytham St Annes RNLI All-weather Lifeboat Boathouse on Thursday 4th January 2018 to be used for driver and shore crew training in readiness for the arrival of the station’s new Shannon class lifeboat towards the end of next month. 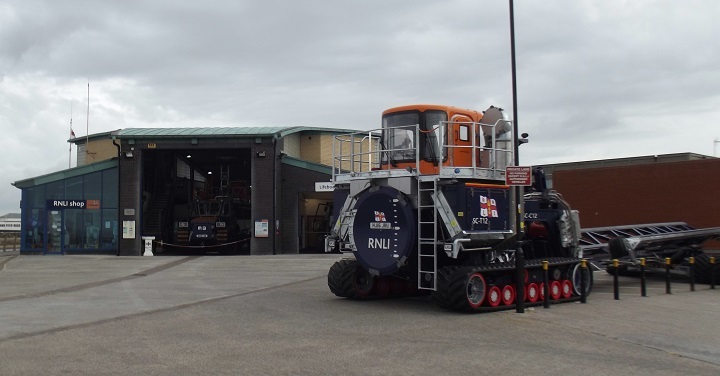 The system, known as a SLARS (Shannon Launch & Recovery System) is designed specifically for the Shannon class lifeboat and therefore will not be used with the station’s current lifeboat Her Majesty the Queen which will continue as before with the Talus launching tractor and carriage. The ongoing training over the next few weeks may also include the occasional arrival of a relief Shannon class lifeboat on the beach. The system, one of the relief fleet SLARS normally used to stand-in if a station one needs overhaul or repair, is expected to remain here at Lytham St Annes until the station’s own £1.5 million unit, at present still being built, arrives to take over. The tractor and carriage unit, although separate for transportation purposes, are permanently connected when on-station allowing the carriage tracks to be powered from the hydraulic pumps in the tractor unit, hence the designation of a “system”. This also allows the bed of the carriage to be hydraulically raised at one end to form a ramp/ slipway which allows the lifeboat to slide off into the sea. The speed of the new system is greater than the existing one, so the time spent reaching the launch site is reduced. This, coupled with the faster Shannon lifeboat, will make saving lives at sea for the volunteer crew even more efficient, and the minutes saved could mean the difference between life and death for the person or persons in danger. The station’s new £2.2 million Shannon class lifeboat Barbara Annecompleted sea trials just before Christmas, and training for her volunteer crew will start at Poole, the sea charity’s head quarters, later this month. Further crew training will follow once she arrives at Lytham St Annes before she replaces the current lifeboat Her Majesty the Queen.